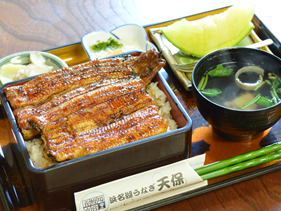 Once you enter the shop through the "Tenpo" noren (shop curtain), you will be overwhelmed by the smell of the grilled eel. 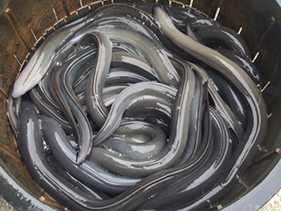 Since we raise and grow the eels, we strictly select and serve the best in-season and fresh eels. 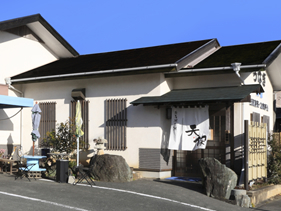 How about stopping by and take delight in premier quality eels on your visit to Lake Hamana or Kanzanji Onsen, celebrate a good time with friends and family or even a reward for yourself. Come see how superior-quality eels are cultured. Even having experienced the eel dishes, few people know how they are raised. The attractiveness of "Lake Hamana Homegrown Eel Tenpo" is touring at the eel farming site and see how they are cultured. The farming staff will guide to an exciting tour at the vast breeding site. It's a hands-on visitor experience tour where children and adults will both enjoy. We are waiting for your visit; surely you will enjoy the beautiful scenery of Lake Hamana too. The "Lake Hamana Home Farming Eel Tenpo" is just over crossing the Hamayu Ohashi Bridge. 5 minutes by car from the Hamamatsu Flower Park and Hamanako Garden Park. Or 10 minutes from Kanzanji Onsen or the Pie Factory, a must stop-by attraction. Come visit us, and collect trip memories of the lake Hamana. Copyright © 2019 EEL FARM TENPO All rights Reserved.